Update 21 October 2016: Queensland Government Anzac Centenary website has a useful summary on conscription in 1916. 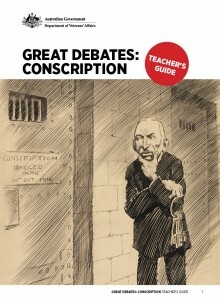 Earlier this year the Commemorations Branch of the Department of Veterans’ Affairs published Great Debates: Conscription, educational materials for Year 9 students. This material is welcome evidence that, after Anzac centenary and century of service ‘commemoration’ that has focused largely on remembrance of heroism and death in pointless battles, there is still room for balanced assessment of the broader scope of Australia’s war history. The package’s focus is on the second conscription referendum (technically a plebiscite) on 20 December 1917, where the question was ‘Are you in favour of the proposal of the Commonwealth Government for reinforcing the Australian Imperial Force overseas?’ (Loaded referendum questions are not a new phenomenon.) This is an interesting twist: by the time of Hughes’s second go the country was well-primed; positions taken in the previous campaign were ready to be cranked up. How different would the DVA package have been if the focus had been on the first referendum? The package is built around eight ‘characters’, four favouring conscription, four against. Students are asked to ‘examine the evidence to ascertain what their character would most likely have felt about conscription’ then engage in a debate around the second referendum question. The characters are a mix of the well-known – Prime Minister WM Hughes (For), Tom Barker, Vida Goldstein and Daniel Mannix (all Against) – and the less well-known – Private AR Blackmore (Against), Private JE Allen, Mrs Kitty Brill and Canon Joseph Pike (For). There is a ‘source analysis worksheet’ for each character, which crucially asks students to look for arguments and nagging questions. The contemporary cartoons and posters used as illustrations are well-chosen. The ‘debrief’ questions about how a conscription referendum might go today add an extra element. The evidence provided brings out the nuances of individual positions, hints at the agony the community put itself through, and points in appropriate directions for further research. Some of us know that Australia was never more divided than it was at this time but we often don’t come to grips with what actually happened. We brim over instead with stuff about battles. DVA’s conscription material should give Year 9 students a somewhat different mindset the next time they are wheeled out for the ritual Anzac Day service. As well as the characters material there is a rubric, a teachers’ guide and some hints about debating. All in all, this is good stuff from DVA. Let’s have more of it.